Children and Sports class 12 Notes Physical Education in PDF are available for free download in myCBSEguide mobile app. The best app for CBSE students now provides Children and Sports class 12 Notes Physical Education latest chapter wise notes for quick preparation of CBSE board exams and school-based annual examinations. Class 12 Physical Education notes on chapter 5 Children and Sports are also available for download in CBSE Guide website. Download CBSE class 12th revision notes for chapter 5 Children and Sports in PDF format for free. Download revision notes for Children and Sports class 12 Notes and score high in exams. These are the Children and Sports class 12 Notes Physical Education prepared by team of expert teachers. The revision notes help you revise the whole chapter 5 in minutes. Revision notes in exam days is one of the best tips recommended by teachers during exam days. 1. Gross motor development involves the development of large muscles in the child‘s body such as sitting, walking, running etc. 2. Fine motor development involves development of small muscles of the body, especially during the small movements of the fingers and hands eg. Holding of javelin, discus and pole, catching a cricket ball etc. 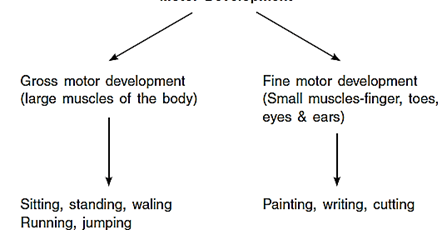 5.1 Motor Development-Motor Development refers to the development of a child’s Bone, muscles and ability to move around and manipulate his/her environment. 1. Nutrition: – Nutritious food promotes good motor development. Sensory motor development is dependent upon nutrition that the child gets to a great extent. Children get stronger and development is good if they get nutritious food. 2. Immunization: – If mother and child both are immunized at a proper time it leads to good sensory motor development. 3. Environment: – Encouragement, love and security help the child to take risk to explore fearlessly and to know more about environment which leads to a better sensory development. a) Increase bone density: weight training helps in increasing bone density. The risk for osteoporosis is lower for the individuals who do weight training exercises at least 3 times a week. b) Helps in getting good shape: Weight training is magical as it shape up all by involving appropriate schedule. Fat peoples can become slim and slim can gain weight and become strong. a) Risk on injuries: there is always a risk of injuries while performing weight training without any companion. In case you are alone and you are not able to do the required repetitions of exercise, you may be injured. b) Less flexibility; weight training reduces flexibility, if flexibility exercises are not done along with weight training. If flexibility exercises are done continuously then such disadvantage can be ignored. Weight training:-Those exercise, that are designed to strengthen specific muscles. By causing them to overcome a fixed resistance, usually in the form of Bar bells or dumbbells. The posture in which the body is so balanced as to produce least fatigue It means balancing the body in accurate and proper manner while sitting, standing etc or during any other actions. b) Better balance, agility and overall physical performance. c) helps in maintaining proper manner of standing, sitting walking of one‘s body. d) it is a measure of one‘s alertness. e) has better alignment, which translates into less injury. (ii)Disease causes the joints to lose their strength and mobility. (iii) Heredity Deformities like Kyphosis and flat foot are sometimes due to hereditary factors. (iv) Overload Over work or fatigue also results in poor posture. (v) Lack of Exercise The maintenance of erect posture requires strength and endurance. Postural deformities are the exaggerated curvature of the spine. The spine is naturally curved but various factors may give rise to the deformities. It reduce the efficiency of individual to great extent & cause more health problem. Flat Foot is a deformity of the feet. In this deformity, there is no arc in the foot and the foot is completely flat. Round Shoulder It is a postural deformity in which the shoulders are drawn, the head is extended with the chin pointing forward. Kyphosis is a deformity of the spine in which there is an increase or exaggeration of a backward curve. (ii) Bend your head backward in standing position. Bow Legs is a deformity opposite knock knee. In fact, if there is a wide gap between the knees, the deformity can be observed easily. Lordosis is a common defect in deformity & posture. Here lumber curve becomes more pronounced and front central position of pelvic region is tilted forward. (i) Congenital scoliosis, which is caused by a bone abnormality present at birth. Neuromuscular scoliosis, which results clue Lo abnormal muscles or nerves. (ii) This is seen in people with cerebral palsy or having partial paralysis. (iii) Degenerative scoliosis, which may result from traumatic (. i. e. Injury Í illness) bone collapse, previous major back surgery, or osteoporosis. (iv) Idiopathic scoliosis, which is the most common type. It has no specific identifiable cause. Children and Sports class 12 Notes Physical Education. CBSE quick revision note for class-12 Physical Education, Chemistry, Math’s, Biology and other subject are very helpful to revise the whole syllabus during exam days. The revision notes covers all important formulas and concepts given in the chapter. Even if you wish to have an overview of a chapter, quick revision notes are here to do if for you. These notes will certainly save your time during stressful exam days. To download Children and Sports class 12 Notes Physical Education, sample paper for class 12 Physics, Chemistry, Biology, History, Political Science, Economics, Geography, Computer Science, Home Science, Accountancy, Business Studies and Home Science; do check myCBSEguide app or website. myCBSEguide provides sample papers with solution, test papers for chapter-wise practice, NCERT solutions, NCERT Exemplar solutions, quick revision notes for ready reference, CBSE guess papers and CBSE important question papers. Sample Paper all are made available through the bes, app for CBSE students and myCBSEguide website.